To me, fresh corn equals the arrival of summer. I have been known to eat multiple ears of warm buttered corn on the cob, and then call it dinner. I think I get it from my Dad. I remember growing up watching him sit at the kitchen table with a plate full of corn on the cob and an ear to ear smile on his face. Who needs the rest of the meal when corn on the cob is involved, right Dad? That being said, corn is also delicious when cut off the cob and added to salads, casseroles, and even desserts. In this recipe, I toss chunks of corn cut from the cob with kale, peppers, shallots, tomatoes, parsley, feta cheese, toasted pine nuts, and a homemade vinaigrette. With a bit of simple prep work done up front, this comes together quickly. The bright green kale visually contrasts with the yellow corn and red tomatoes. This makes for a beautiful presentation. 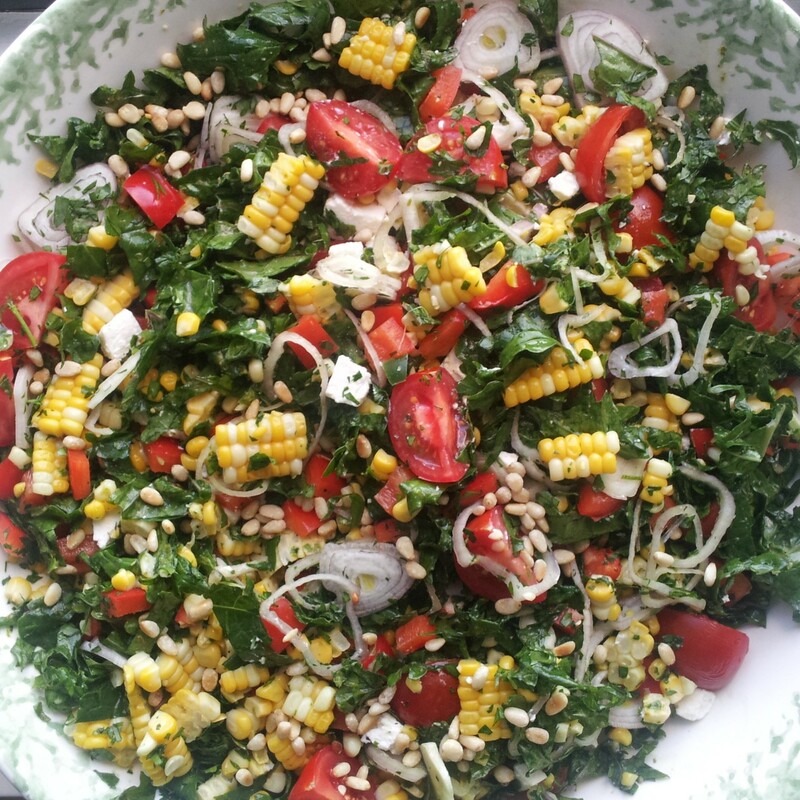 Kale and corn salad with basil lime vinaigrette is my new favorite salad! I plan on making sure fresh corn on the cob is in my kitchen. Thus, I plan on making this again and again. I hope you make this salad soon. Your taste buds will thank you. Make basil lime vinaigrette by combining basil leaves, lime juice, lime zest and garlic in a food processor. Pulse 2-3 times until coarsely chopped. With the machine running, add olive oil in a slow steady stream, and process until emulsified. Scrape down the sides of the bowl, add salt and pepper, and process to combine. Bring a large pot of water to a boil. Add corn to boiling water, reduce heat, and let simmer for 5 minutes. Remove corn and set aside to cool. Cut corn off the cobs and reserve. Add kale to a serving bowl and toss with the vinaigrette. 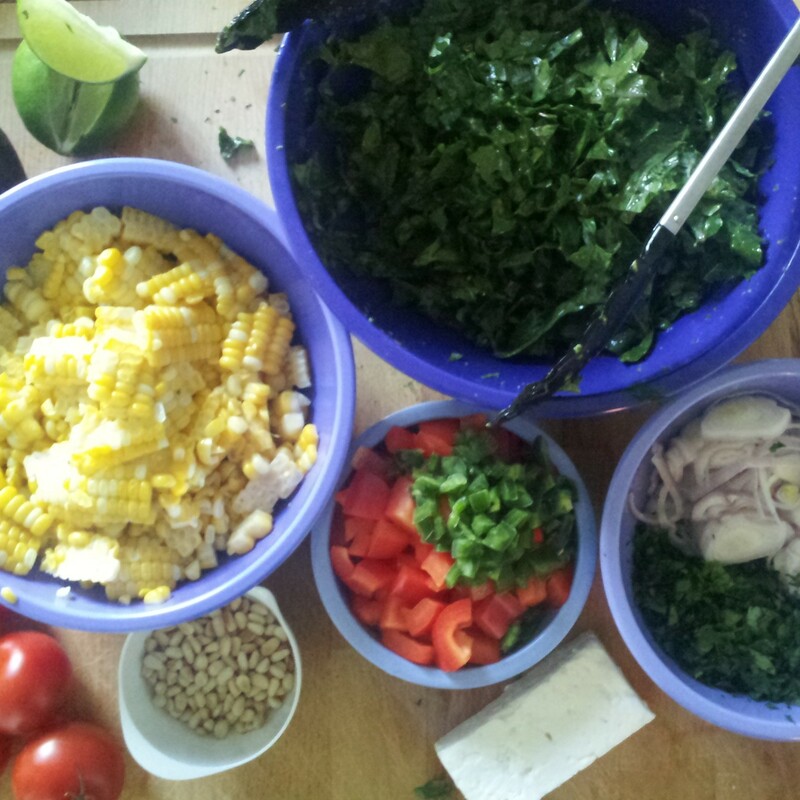 Add corn, bell pepper, jalapeno pepper, shallot, tomatoes, and parsley. Toss to combine. Add feta cheese and pine nuts. Serve and enjoy. Hi Celeste, let me know if you try out the recipe, and what you think! Thanks for the follow. I look forward to getting to know you better as well.